With its lush vegetation, effortless accessibility and modern recreation amenities, Escondido Creek Parkway will be the favorite outdoor hub in the City of Kenedy, a gathering place for the community to relish their time in nature and with each other. This inviting linear park will transform the way people connect with their community and the environment by providing unparalleled opportunities to safely recreate in a native landscape. In the shifting shade of willows, by a lively chorus of birdsong, along a rippling blue reservoir, people will come together at Escondido Creek Parkway. Escondido Creek is a modest ephemeral waterway that runs through the City of Kenedy in Karnes County, Texas. As a significant tributary in the southern basin of the San Antonio River Watershed, the San Antonio River Authority has shared a long history, since the 1950s, with the local leaders and citizenry to construct, operate and maintain thirteen dams within the creek’s watershed. The Escondido Creek Parkway Project is a vision to create an attractive linear park with features that allow the community new opportunities to sit, stroll, run, play and enjoy the outdoors along a waterway full of benefits. 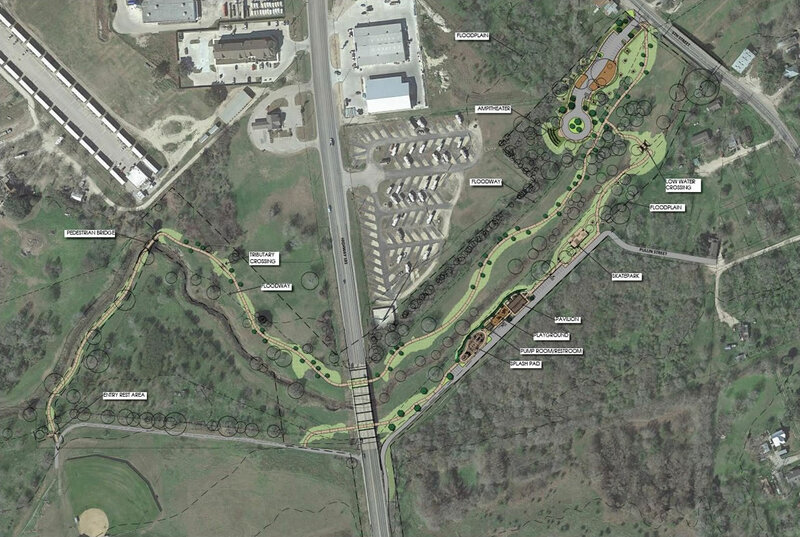 In part, it will function as a safe thoroughfare, connecting Joe Gully Park and sports fields to homes and schools by providing trails under Highway 181. Recreational amenities in the linear park include an over one-mile long trail which is 10 feet wide to allow multi-purpose use—such as hiking and biking surrounded by beautiful Texan native landscaping. Some prospective amenities include: a playground and one pavilion providing ample shade, an amphitheater, ten picnic tables, fifteen benches, monuments to Parkway donors, a parking lot with 25 spaces and an attractive man-made pond. These enhancements will promote a healthy lifestyle and enjoyment of the outdoors for generations to come. What additionally sets Escondido Creek Parkway apart from other regional parks, is its dedication to a balanced relationship with the ecosystem. The park’s primary water feature, a small pond bound by weirs which bridge the reservoir, will be deep enough to support aquatic life and potentially offer fishing opportunities. The existing large shade trees and wildflowers as well as the proposed vegetation offer habitats to birds and fundamental pollinators. Park goers will likely see or hear animals in their daily interaction. Furthermore, vegetation buffers afford the public and wildlife a sense of intimacy and stillness next to well-traveled roadway. Based on extensive discussions between the San Antonio River Authority, City of Kenedy elected officials, community leaders and other stakeholders, the Escondido Creek Parkway Project is projected to cost just over $3.5 million. Funding for this remarkable and transformative community project is a joint effort between private donations, grants and public monies. If you have questions or would like to learn more about the Escondido Creek Parkway, Contact Us.